When it's hot as hell outside (as it is right now, everywhere), a little sun shower is literally a gift from the heavens above. But a soaking wet shirt, when you're out and about and not in the habit of carrying around a spare just in case, is less than ideal. The Supermarine Rain Shirt, by tailored performance brand Outlier, is the answer to all your warm, rainy troubles. The breathable button up shirt is completely windproof and highly water resistant, thanks to a complex weave of tight and loose cotton fibers that lock out moisture without compromising the breathability of the fabric. 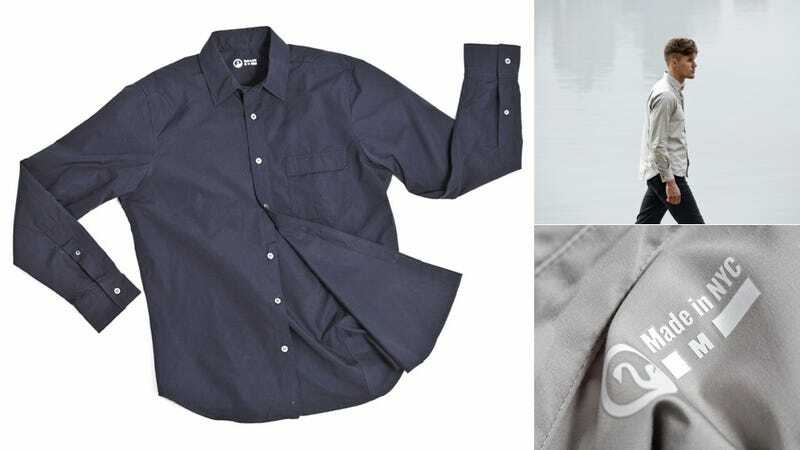 The company concedes that the Supermarine shirt is not waterproof to government standards, but you'll be able to walking around in a storm for a whole hour and remain dry. Enough time to get out of the rain and into a movie theatre (the best place to wait out a storm).